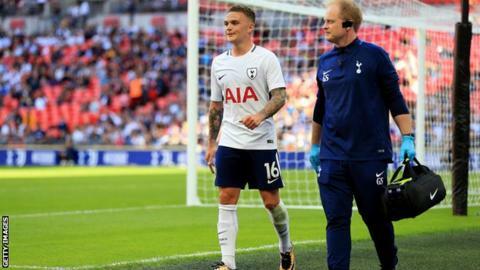 Tottenham defender Kieran Trippier is the second player to be ruled out of England's World Cup qualifiers against Malta and Slovakia because of injury. The 26-year-old right-back missed training with his international squad this week and has returned to his club. Everton goalkeeper Jordan Pickford also pulled out of Gareth Southgate's squad after picking up a muscle problem during Saturday's defeat by Chelsea. The England manager has not called up replacements for the pair. England play Malta away on Friday before hosting Slovakia on 4 September. Pickford is yet to make his senior international debut but he was on the bench for England's World Cup qualifiers against Slovenia and Scotland in October and November 2016. Defender Phil Jones and midfielders Jake Livermore and Nathaniel Chalobah were all involved in training on Thursday after sitting out earlier sessions because of minor injuries. Alex Oxlade-Chamberlain was also involved in the session, before the announcement of his transfer deadline day switch from Arsenal to Liverpool.